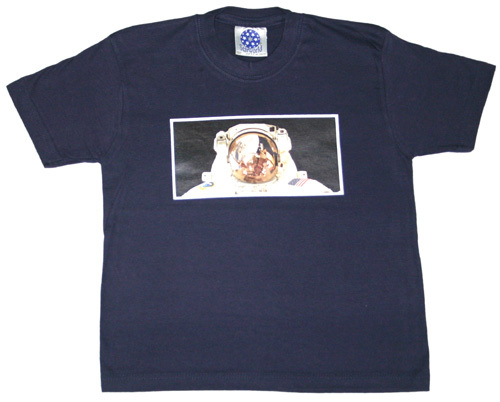 "Spacewalk" exclusive Spacekids navy blue short-sleeved t-shirt - spacekids - space toys, dressing up costumes, kids spacesuits, astronaut food, cool space stuff! A Spacekids exclusive! A fab navy-blue short sleeved t-shirt with photographic transfer print. An eye-catching design featuring an image of aUS astronaut on a spacewalk, which is sure to be a firm favourite. The t-shirts are great quality, 100% cotton (excluding transfer) with a round neck. Machine washable.